It’s wonderful how many beauty options are on the market now, but consumers can easily get overwhelmed and confused. When is a facial peel warranted? What results can you expect from a mask? And why are there so many different scrubs? Let’s take a peek at each of these categories of skin care. Facial scrubs contain tiny rough ingredients to exfoliate your skin. The most common way to do this used to be with plastic microbeads, but these are being phased out as an environmental hazard. As of July 2017, personal care products in the US should be microbead-free. Instead, look for natural ingredients like apricot seeds, crushed walnut pieces, fruit acids, salt and sugar to do the job. These are all better for both your skin and the environment. Beauty experts and dermatologists debate how frequently one should exfoliate. Once or twice a week is the most common answer. But everybody’s skin is different, so some people with sensitive skin might need to take it easy on exfoliation. If your skin turns red or feels tender, you’re over-exfoliating. So why would you want to rub rough things on your skin? Exfoliating digs a little deeper than your ordinary face wash, releasing trapped grime. Your skin will be smoother and less flaky. If you’re prone to acne break outs, try a scrub that contains salicylic acid. While facial scrubs are immediately rinsed off, you leave a mask on for a prescribed time to penetrate your skin more deeply. The main benefits are to refine your pores, diminish fine lines, even out skin tone, improve skin hydration and make your skin appear firmer and younger. That said, the aims of masks vary widely depending on their ingredients. If you want to moisturize, look for emollient ingredients like squalene, ceramides, dimethicone, glycerin and ammonium lactate. People who prefer sticking to ingredients they can pronounce, understand and even eat, will find that honey, avocado, and coconut cream are all natural emollients. Acne-prone individuals can buy masks that include salicylic acid. Or try a clay mask. 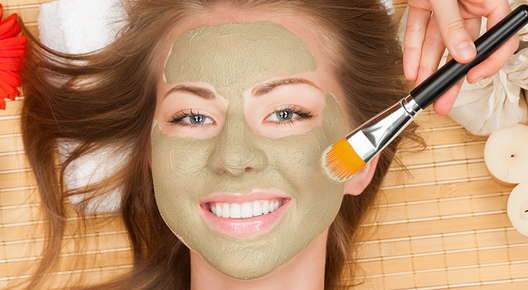 Bentonite clay is a popular mask ingredient to decrease oil production and leave the skin soft and glowing. Most masks should stay on your face for 10 to 20 minutes. Peels are a more aggressive skin treatment, used to brighten your skin, remove dead cells and lessen the effects of sun damage. Some peels also increase collagen production. A peel removes the outermost layer of skin. Dermatologists offer a more intense sort of peel. The types you buy over the counter or have done at a salon will be gentler. However, even these can be too much for sensitive skin. If you want to try a peel, start with the gentlest preparation to make sure your skin can handle it. And don’t try a peel immediately before an important event – especially one that involves being photographed – as your skin may be red and tender for a few days. Fruit enzyme – These natural peels leave your face feeling softer and smoother. Lactic acid – This one is usually gentler and more hydrating than other peels, and is good for reducing sun damage. But it’s derived from milk, so is not for vegans or the lactose intolerant. Mandelic acid – Good for reducing acne and sun damage, it’s derived from almonds. Salicylic acid – This is the big guns for treating rosacea and bad acne. Lots of over-the-counter products are available. But many people prefer to let a trained esthetician advise and administer the appropriate masks and peels in the relaxing environment of a salon. If you’d like to discuss the treatments we offer, give us a call.